Akiuk Memorial School is committed to excellence in athletics as part of a larger commitment to excellence in education. 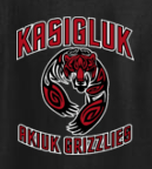 As stated in our school mission statement, the goal of our athletic programs are to offer students the best opportunities to participate utilizing both Yup'ik and English instruction. At Akiuk, we do things"The Grizzly Way". Our guiding principles are superior citizenship, sportsmanship, and dedication to positively representing the Kasigluk community. Athletic programs carry health and education value to our school and community. We are therefore committed to presenting athletic opportunities that promote and support the educational, emotional, physical, and social development of Akiuk students.